Allow me to put on my DJ voice and say Music heads....this one's for you. West LA Music is hosting a Steve Ferrone Drum Clinic and it is happening on Friday, 8/28. As a special guest, the clinic will feature Fred Gretch III. 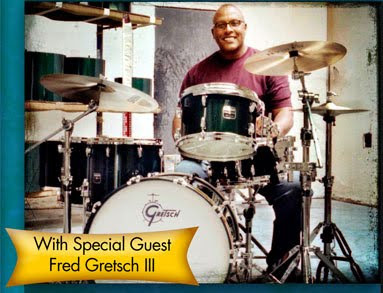 Fred Gretch is music legend and a go-to-man for major artists and bands like Eric Clapton, Anita Baker, Average White Band, Heartbreakers, Whitney Houston, Paul Simon, and more. As a bonus, you'll get a bunch of freebees including 50% off any LP, TOCA and Gibraltar items. With the purchase of some great kits or a sabian, you'll get an autographed book and Gretch rug, Gretsch snare and a 14" X-Plosion Crash cymbal - all free! And you know Gretsch music instruments are top of the line. RSPV ahead of time - they want to know how much free stuff they're going to be giving away.